We are Train2EU, the first European railway company. In August 2016, Train2EU published its first research report on the European passenger rail potential. The Erasing Borders report is the first ever to combine a holistic modelling approach to European demand with a coherent rail network analysis. Its main conclusion: an additional 59 million passengers could be served today without adding any infrastructure. All that is needed, is better co-operation between governments, train companies, infrastructure managers and ticket providers. The Passenger Rail Summit 2016 an "innovative and refreshing afternoon of inspiring ideas." 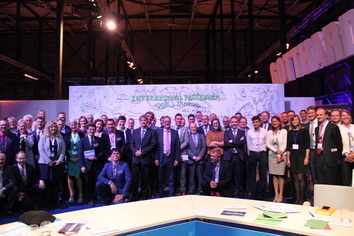 ﻿﻿On 21 June, over 140 professionals from across Europe met in Rotterdam to discuss passenger-focused initiatives to make cross-border train travel across Europe easier and as seamless as domestic travel tends to be. We are Train2EU, the first European railway company. We believe in a Europe where the train forms the logical alternative to the car and airplane. This is necessary to combat congestion, climate change and the using up of fossil fuels. The internal European borders have disappeared over the past decades. An open and flexible system of international trains fits this new reality. We want to improve the European railway network with the help of open and transparent booking systems and open travel information. We are facilitating the way for new entrants into the international market, though not at the cost of current players. For this however to be possible, national governments must feel the responsibility to facilitate cross-border travel. We are Train2EU, a group of young professionals with a passion for international train travel. Our generation has grown up without European borders, with the Internet and smartphones. We use the power of cooperation and sharing knowledge and united in Train2EU, we are working together to make the dream of integrated international travel a possibility.